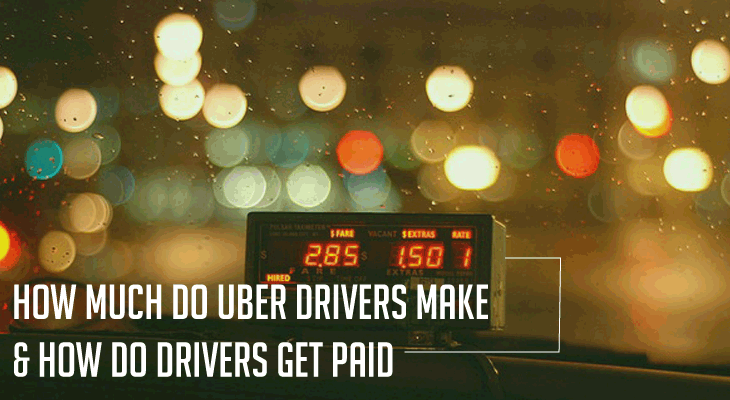 →How Much Do Uber Drivers Make and How Do Drivers Get Paid? Working in this economy has been a rollercoaster ride. I’ve been hired, fired, and laid off quite a few times. Up until recently, I wasn’t sure what I was going to do for money. Until I gave Uber a shot, and took my first few drives. Since Uber started in 2009, Uber has almost single-handedly started the ride-sharing revolution and with monumental growth in major cities plus 9 billion dollars in funding - the company seems unstoppable. There is no Uber driver salary. Drivers are not employees, we are private contractors. An Uber drivers pay is part of the fare that Uber charges to passengers. When a passenger books a ride, a Booking fee is automatically charged. This varies from area to area. Toronto has $1.50, while high-traffic areas like Las Vegas have $1.70. Fares are computed based on the duration of your trip, and the miles that you travel. In some states, there’s also a “Base Fare” that’s added. At certain times and places, we also get ‘Surge Pricing’, usually when there’s high demand for the service, or there’s traffic in the area. Uber multiplies the fare to the surge price. If ‘Surge Pricing’ was at 1.4x during the trip, then the total fare would be $41.16 ($29.4 x 1.4). How do Uber Drivers get paid? Deduct the Booking fee of $1.70, and the remaining balance of $41.16 will be divided - 20% for Uber and 80% for the Uber driver. For the above example, the driver would take home $33.92 ($41.16 x .8), and Uber’s commission would be $8.23 ($41.15 x .2). How Much Does An Uber Driver Get On Average? Uber drivers average $14-15 per trip. Per hour, the driving rate (including Uber’s cut) is at $19 and it’s considerably higher than what other full-time drivers get on an hourly basis from what I can tell. ($13.41, from the US Bureau of Labor Statistics). I’ve calculated that if I work 60 hours per week, I can roughly earn a gross income of $1140 ($19 x 60 hours) per week. I know some people might be turned off by those hours but honestly, I don’t mind working - what I don’t like is working for someone else. Multiplied by 52 weeks or 1 year = $44,460 per year. It’s not exactly what Uber is claiming but of course, I’m only in one area. You might be able to charge more if you are in a different Uber level (UberBlack for example). What Are the Expenses to Expect? As we are private contractors, Uber will not share with any of our expenses. Our expenses are either fixed or variable. Fixed expenses include car payments (or a car rental), plus car and health insurance. Variables include expenses like gas, vehicle maintenance, and tolls. There’s also taxes, which are unavoidable in a sense. For tolls, when we pass by an area with a toll during a trip, the toll is added on top of the regular computation of the Uber Fare. When we don't have a passenger while crossing a toll area, drivers unfortunately - absorb the cost of the toll. I try and pick up people around the area though, instead of driving back to my home base. Uber drivers pay their own taxes. And depending on how much an uber driver makes at the end of the year, I pay federal and state income taxes (about 25% of my annual income) as a self-employed person with the 1099-MISC form. Paying quarterly and annually, taxes are based on net income (total gross income – expenses). Expenses that can be deducted include most of our regular operational expenses – gas, maintenance, tolls, etc. Who Is the Perfect Uber Driver? Unlike being a taxi driver with its rigid requirements, becoming an Uber driver is relatively painless. Although Uber has a few hoops to jump through, I’d say anyone with a good record would be able to drive for Uber. I did a bit of searching and found that Uber released a study by the Benenson Strategy Group, which showed data from a hundred Uber drivers around 20 US cities. The study said more than half (52%) are part-timers (mostly driving UberX), 18% are Pros (UberBlack chauffeurs), 18% are Crossovers (ex-taxi drivers), and the remaining 12% are New Enthusiasts (new to the business, and looking for an alternative source of income). For me, I’m under the New Enthusiast category and Uber has now become my main income source. And like the many people polled in the study, I enjoy being my own boss and love being able to work whenever I want. I can hang out with my niece and nephew more and even pick them up from school so my sister doesn’t have to. My earnings are also better with Uber and I think a lot of other people feel the same way. A few groups have been angered over rate changes and such but I’m just happy to have a platform where I can make money like this. At first, when I had no idea What An Uber Driver﻿ Was, I didn't care, but now I really wish people could be more thankful that these types of businesses exist and allow us to connect with other people while earning decent money too. Can You Really Make Good Money with Uber? Always be a smart Uber driver. Be aware of places in your area that have high passenger trip bookings. Be there, and get more passengers. Work during high-income hours. Surge Pricing is an Uber driver’s best friend! Be conscious of the times and places where ‘surge pricing’ happens. Work in that time and area, and you can earn more money while working fewer hours. Do a good job, and get more tips! While the Uber app has no option for passengers to tip (Uber doesn’t want the rider to feel obliged to tip), I’ve received cash tips before. I’m guessing it was because I’m easy going and try to be a pleasure around or that I had some fresh water and other amenities in the car. Explore different Uber services. While there’s no big difference in fare income from UberX (more trips, costing less) and UberBlack (less trips, costing more) - in UberBlack, tips are more common. Extra tips always helps keep the lights on, gas in the tank, and motivation in the bank. Uber also offers sign-up bonuses to new drivers up to $500 and if you live in a city where Lyft is also in business - refer them and get them and get a referral bonus too. Learn More About Driving For Uber Here!